Here is a thing everyone wants:A miracle. Here is a thing everyone fears:What it takes to get one. Any visitor to Bicho Raro, Colorado is likely to find a landscape of dark saints, forbidden love, scientific dreams, miracle-mad owls, estranged affections, one or two orphans, and a sky full of watchful desert stars. At the heart of this place you will find the Soria family, who all have the ability to perform unusual miracles. And at the heart of this family are three cousins longing to change its future: Beatriz, the girl without feelings, who wants only to be free to examine her thoughts; Daniel, the Saint of Bicho Raro, who performs miracles for everyone but himself; and Joaquin, who spends his nights running a renegade radio station under the name Diablo Diablo. They are all looking for a miracle. But the miracles of Bicho Raro are never quite what you expect. 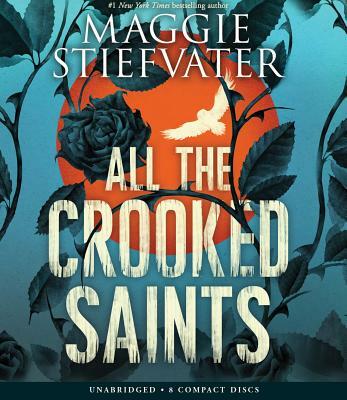 Maggie Stiefvater has been called “a master storyteller” by USA Today and “wildly imaginative” by Entertainment Weekly. Now, with All the Crooked Saints, she gives us the extraordinary story of an extraordinary family, a masterful tale of love, fear, darkness, and redemption.